Ballinafad village is based in County Sligo nestled at the foot of the Curliew mountains overlooking the spectacular Lough Arrow. Ballinafad was once on the busy main Sligo Dublin road and has since been bypassed. The village has a quaint church, a bar the Mayfly Inn and a shop post office. 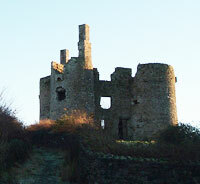 Ballinafad Castle is located on the edge of the village of Ballinafad, just off the main Dublin to Sligo road. It was built at the time of the plantations in the later 16th century, but resembles a 13th century castle rather than the type of castles that were usually built at the time of the plantations.